Tahari recipe by Atif Hasan at PakiRecipes.com. 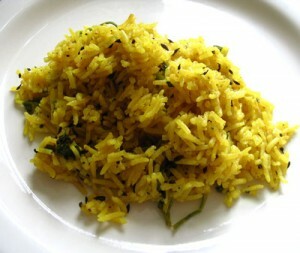 Rice cooked in the blend of spices, potato and turmeric powder. Fry the sliced onion in oil until transparent. Add all spices including green chilis and chopped tomato along with 1/2 cup water and cook on medium flame until the spices are well mixed and the tomato has softened. Then add the potato and 1 glass of water, cover and cook till the potatos are almost soft. Add in the presoaked rice and water so much so that it reaches 1 1/2 cm. above the surface of the rice. Cover and cook on high heat until the rice is soft. Then lower the heat to the minimum and remove from heat after 5 minutes. There are 14 comment(s) for this recipe. Mmmmmmmmmm.... Me and my family enjoyed it! I m 13 & was preparing a new not sooo complicated rice dish for the first time. Evryone loved it. Glad to have it on net!!!! i am sure they mean 2-3 and 3-4.take it ez. 34 potatoes & 23 chillies and 34 tablespoons of oil-- all in one and one quarter cup of rice!! sorry, i just can't stop laughing and laughing and laughing. good entertainment, though. ya to ek dam bakwas tahari ha ase to nhi bntee??? tumhe tahari banana sikhaya to kisne????? OMG how many potatoes and chilies , are u sure about this oor do u mean 2/3 chilies and 2/3 potatoes cause 34 is alot for two to eat.